Practitioners from all over Europe who participated in the European Falun Gong Experience Sharing Conference in early October share a common wish: to tell more people about the goodness of Falun Gong and call for an end to the brutal persecution of it in China. They held a series of activities to help people understand Falun Gong, and several of them shared their thoughts and insights after a grand march held in downtown Madrid. 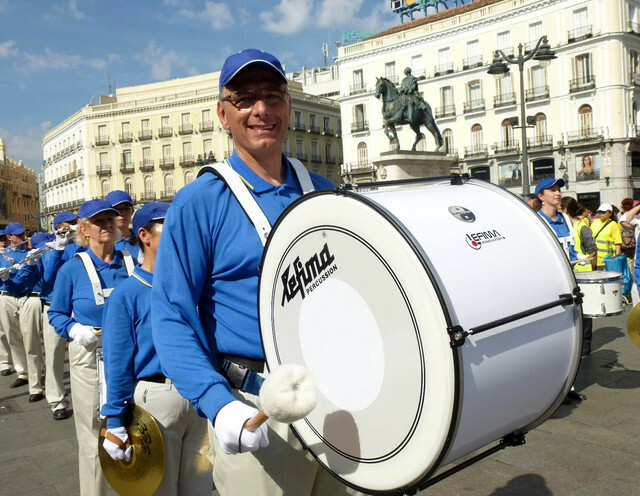 The three-hour grand march held on October 4, 2014, was led by the Divine Land Marching Band and attracted spectators on both sides of the main roads in Madrid. It won rounds of applause and cheers from the crowd. "I'm delighted! 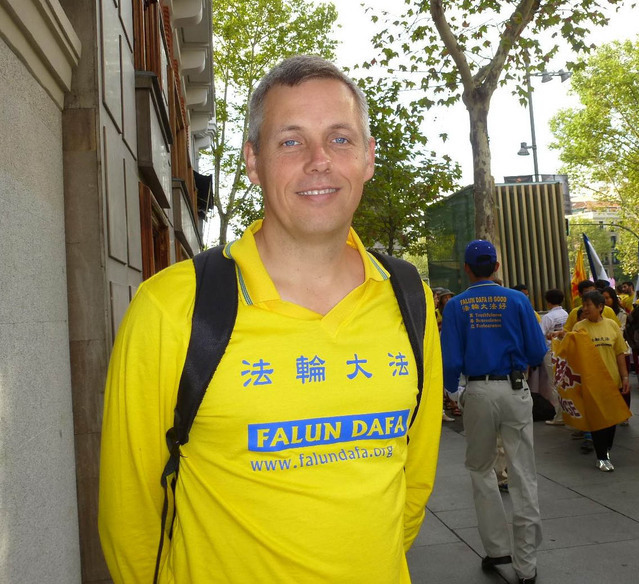 because we want to share the joy, hope, beauty and kindness through our performance," said Karsten Noell from Germany, who began practising Falun Gong in 1997. He was at the front of the Divine Land Marching Band playing a large drum during the march. He had a brilliant smile the entire way where it ended at Puerta del Sol (“Gate of the Sun”). When he was asked if he was tired after marching for three hours with such a big heavy drum, he answered with a smile, "I'm not tired at all, and my heart is filled with joy and happiness. This march is very worthwhile." Marcus is a high school teacher in the southern Swedish city of Helsingborg. 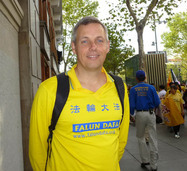 He began practicing Falun Gong five years ago. He hopes the persecution will soon end. "Many innocent practitioners in China have been subjected to abuses and tortures, and have been killed in the persecution. There even occurs such a heinous crime as harvesting organs from living Falun Gong practitioners." Marcus said, "Although China is far away from us, I want to help the Chinese people and stop such an inhuman persecution." Marcus also shared his benefits from practising Falun Gong, "My mind and body have greatly improved since I began the practice, and I have become more considerate of others." "I participated in the march hoping to share with people the beauty and compassion of Falun Gong, and also raise awareness of the brutal persecution of it in China," said Elke from Germany who began practising Falun Gong in 2001. “Practitioners in China are subjected to such a brutal persecution for following a practice that teaches you to live by the principles of Truthfulness-Compassion-Forbearance. The Chinese Communist regime even harvests organs from living Falun Gong practitioners. Such a crime cannot continue," said Nele Roegiest who teaches history in Belgium. 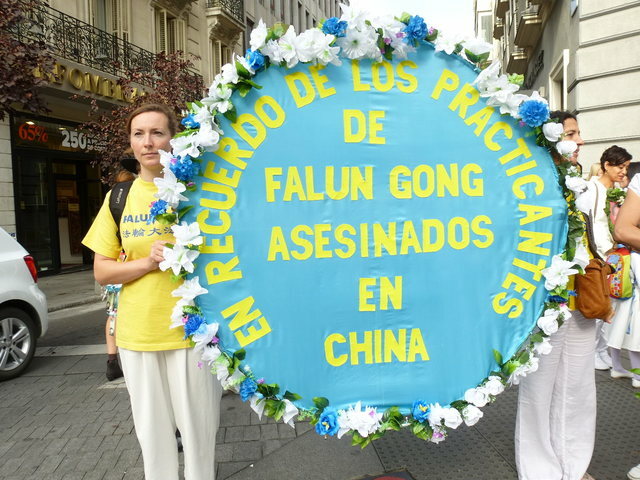 She carried a large wreath with another practitioner with the words in Spanish that read: In memory of Falun Gong practitioners in China who have lost their lives in the persecution. Nele said that her life experienced a complete change when she began practising Falun Gong. With the many benefits she has experienced, she can't imagine how her life would be without it. 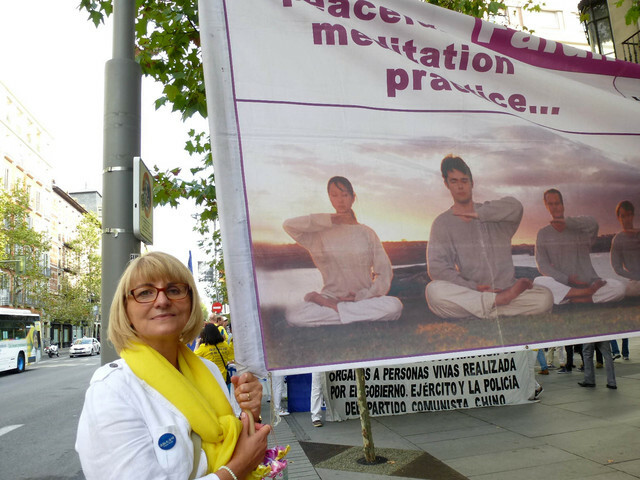 Dominique Ture from southern France has practised Falun Gong for four years, and has also experienced a tremendous change after she began practising. "I no longer complain about others when encountering a problem, and my life has developed in a more positive direction since abiding by the principles of Truthfulness-Compassion-Forbearance. I find my life has become more meaningful and precious," said Ms. Ture who was dressed in white and carried a portrait of a practitioner who died in the persecution in China. "They are my fellow practitioners in China who are noble and moral people, but are being killed under the inhuman persecution by the Chinese regime. It's horrendous! We must let the whole world know that such a persecution is taking place in China. We call upon people to work together with us to stop such an evil persecution." "We support you! We agree with your appeal! Our hearts are with you!" said Mavia Cake and Clava, both have lived in Madrid for many years. They were very happy to see the grand Falun Gong march. A Chinese couple who travelled from China to Madrid were surprised to see the march, "It's incredible!" The lady said, "Why are there so many Falun Gong practitioners! I heard that they are only a portion of practitioners in Europe." She was amazed to see many Western practitioners in the Falun Gong procession. A practitioner told them to remember the words "Falun Dafa is good, Truthfulness-Compassion-Forbearance is good" when they face disasters. They nodded their heads and thanked the practitioners.